I first met Justin Trudeau when he was a MP and up in Thunder Bay to do a talk for a local charity. My second visit was when Justin made a quick stop at the airport just before the election. 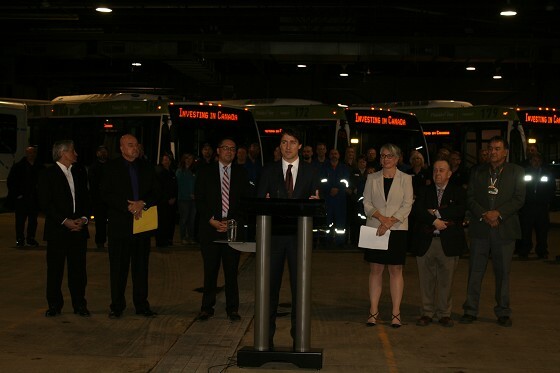 The third time seeing now Prime Minister Justin Trudeau was at Thunder Bay Transit where he made an announcement about how his government intend to fund transit in Thunder Bay. Times have certainly changed when you visit a Prime Minister as first I was questioned by local police and asked to show my identity. Then you placed your camera bag on the transit building floor and had a police dog sniff it. The number of RCMP and other security was quite high. Also the schedule was tightly controlled with limited time. When you are Prime Minister it is a whole different thing it seems. Be ready for lots of steps and less time. My first visit with Justin Trudeau was just me and him for 15 minutes! Don’t get me wrong it was fun to see the spectacle and I like seeing the enthusiasm for our Prime Minister. It is also good to see our city well represented in the Liberal government as well with MP’s Patty Hajdu, cabinet minister and Don Rusnak. Something tells me this should help us see some good progress here in our part of the world!